A classic Chuck Jones comedy, “which is to laugh!” Wanted posters scattered across Sherwood Forest tell us that Daffy Duck is Robin Hood, but Porky Pig, as fat Friar Tuck, who would join up with Robin Hood and his band of jolly outlaws, isn’t so easily convinced. 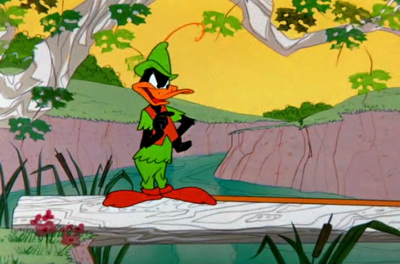 When Porky comes across the klutzy Daffy, he can’t believe that he could possibly be Robin Hood. Daffy tries to set the record straight.